Aiseesoft DVD to iPhone 4 Converter for Mac is the fastest and best Mac DVD to iPhone 4 software that designed for Mac users to rip DVD to iPhone 4 (3G) on Mac. 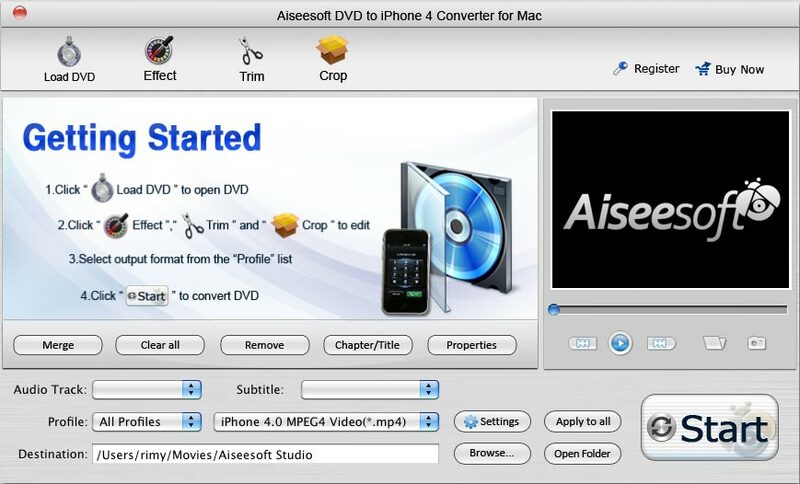 Aiseesoft DVD to iPhone 4 Converter for Mac helps you rip DVD movies to iPhone 4 MPEG-4, H.264/MPEG-4 AVC, MOV, M4V video and iPhone MP3, M4A, AAC, WAV audio on Mac OS X. Its output video can be perfectly played on your iPhone 4, iPhone(3G), iPhone 3GS, iPhone 4 and iPod as well. A professional Mac DVD to iPhone 4 Converter to rip DVD to iPhone 4 on Mac. 512MB RAM, Super VGA (800?? ?600) resolution, 16-bit graphics card or higher. ...... Mac program because it was born with powerful video/audio editing functions. It allows you to do video trimming, video cropping, watermark adding, select subtitle and audio track, even merge several titles or chapters into one file, etc. Input one or more files and set several different output file formats for each to save conversion time. This is a professional Mac iPhone converter fully compatible with Mac OS X, supports Snow Leopard and Tiger which manage on computers with either Power PC or Intel processors. It is available to convert/rip DVD to iPhone 4 video MPEG-4, H.264/MPEG-4 AVC, MOV, M4V and extract DVD to AAC, MP3, WAV, AIFF, M4A audio using this Aiseesoft DVD to iPhone 4 Converter for Mac. Aiseesoft DVD to PSP Converter for Mac is a powerful Mac DVD to PSP Converter. Qweas is providing links to Aiseesoft DVD to iPhone 4 Converter for Mac 3.2.28 as a courtesy, and makes no representations regarding Aiseesoft DVD to iPhone 4 Converter for Mac or any other applications or any information related thereto. Any questions, complaints or claims regarding this application Aiseesoft DVD to iPhone 4 Converter for Mac 3.2.28 must be directed to the appropriate software vendor. You may click the publisher link of Aiseesoft DVD to iPhone 4 Converter for Mac on the top of this page to get more details about the vendor.